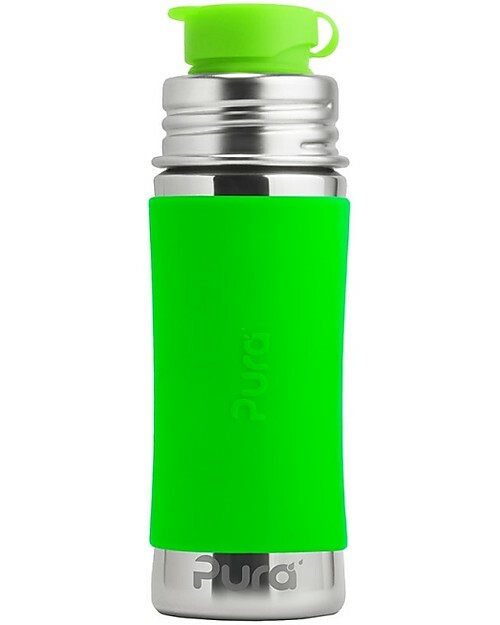 The durable and eco-friendly 325 ml insulated Bottle with Sport Top from Pura Kiki is the must-have feeding item for all babies. Its 100% plastic free, anti-bacterial stainless steel design eliminates any chance of BPA, PVC, lead, phthalates and other petroleum by-products. The bottle’s internal volume markings make measuring your child’s milk a breeze, with every ounce clearly displayed to help make your day a little easier. This highly functional item features the unique Baby Grows ... Bottle Evolves™ technology that allows this bottle to grow with and adapt to the changing needs of your child! A gift that adapts with your baby, you can easily convert it from a sport bottle to a sippy cup, infant bottle or adult bottle by simply swapping the Silicone Sport Top for a teat or straw (sold separately) to transform it into a long-lasting gift that will survive far beyond the early years. An environmentally conscious choice, this bottle is backed by a lifetime warranty, making it an irresistible investment for your growing family. Pura Kiki is the safest bottle on the global market and the only 100% plastic free feeding solution. Safe for your child and environmentally conscious, they provide an eco alternative that is free of BPA and totally non-toxic. Bottles are made of toxin free #304 stainless steel in a range of bright colours to stimulate your child’s senses. The winner of 27 industry and business awards, Pura Kiki’s high quality construction makes it a durable and long-lasting product suitable for children from newborn. Their lifetime guarantee also ensures that this product will stay in your family for years to come.